EVENT IS RAIN OR SHINE, PLEASE DRESS APPROPRIATELY! Thank you all for volunteering. We are getting closer to the date. 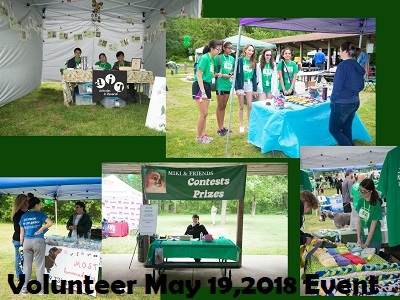 If you know anyone who would like to volunteer and has not registered, please encourage them to follow this link to sign up. 8:00 a.m. Registration, Certified 5K Run for AIR. Start 9:00 a.m.
9:00 a.m. Registration, 5K Walk for AIR with friendly dogs. Start 10:00 a.m.
On Saturday, please arrive 15 minutes before your time slot. If you have a 6:00 am arrival time you do not have to arrive 15 minutes early. When you arrive, please go to the volunteer check in table and sign in to confirm your volunteer location. You will receive a volunteer lanyard, a ticket to pick up your free t-shirt and you will need to sign a waiver. If you are under 18, you will have to have a parent or guardian sign the waiver. The waiver is attached to this email for your convenience so you can bring it with you. If you need a community service letter for volunteering, you can pick one up after your shift at the volunteer table. You can also have any paperwork you need signed at the volunteer table as well. This will not be available at any other location at the event. Looking forward to seeing everyone there and thank you for volunteering. Changing the conversation about mental health will take everyone’s participation. YOU can help! AIR is in need of speakers to share the Coming Up For AIR message with students. These presentations usually take place during the school day. Occasionally, the program is presented to parents or evening student groups. The AIR Community Outreach program operates throughout the year. AIR volunteers, including therapy dog teams, attend community events to start conversations about good mental health. The AIR Dogs: Paws for Minds program is looking for foster families to work with rescue dogs. The dogs need to come to training classes to prepare them for their future as an emotional support animal. The foster family also agrees to share and showcase the dog at weekend health fairs and community events to help match the dog up with his/her forever family. Please help AIR achieve its mission by volunteering at our Annual Miki & Friends Run/Walk for AIR. The best way to become involved is to join the AIR e-newsletter. This weekly newsletter provides information regarding all upcoming events. Additionally, you can join AIR on Facebook at facebook.com/AttitudesInReverse. If there is an event you would like to participate in or for more information on volunteering, contact us. List of Events that needs Volunteer. You could also directly sign up for the Event. Event that needs to be filled up and confirmation. if you are free and need guidance. This is in Calendar form. a link where you would see the number of volunteer hours you logged in and events you participated.